Jimmie Dodd was born in March 1910 in Cincinnati, Ohio. He is best known as the host of the Mickey Mouse Club TV show in the second half of the 1950s. Dodd died in Honolulu, Hawaii, in November 1964. 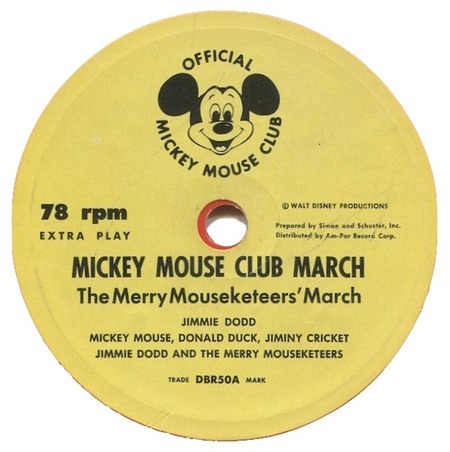 His original recording of The Mickey Mouse Club March was released on a 10" 78 RPM EP on the Walt Disney Productions label, number DBR-50. Elvis as a Mousketeer? Yes, and he wore the mouse ears on stage, too! Well, it was April Fool and the man always enjoyed a laugh! Elvis sang the song during the midnight show during a Las Vegas stint; he sang it again during a Lake Tahoe engagement on 9 May 1976—perhaps April Fool's Day was later that year... Neither of his renditions have been released officially, but the first is available on an unofficial CD.